"We are really thrilled that Mike Piazza has taken his rightful place among the other greats in Cooperstown. Mike's offensive prowess, ability to deliver in the clutch, and tireless work ethic helped him become one of the great catchers of all-time. On behalf of Mets Ownership, front office staff and our fans, we congratulate Mike, his wife Alicia, his parents, Vince and Veronica, and the entire Piazza family." "We are truly thrilled to honor Mike by retiring his number during a weekend-long celebration recognizing his incredible career." 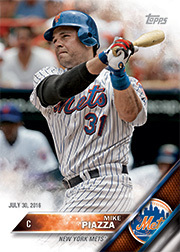 "Without a doubt Mike Piazza was one of the top hitting catchers in the history of the game. For Mike to compile the stats he did while catching is amazing. His election to Cooperstown is most deserving." "It is such a tremendous honor to have my number retired alongside the great Tom Seaver. My time as a Met was truly special and I want to thank Fred, Jeff and the entire organization for this incredible gesture."